Ricardus M. Haber (1952- 2006) Father of the nature movement and one of the earliest pioneers of the Lebanese environmental activism movement He began one of the first environmental conservation groups called Friends of Nature (FON) in December of 1972, at AUB. In recognition of his major contribution to the creation of the Horsh Ehden Nature Reserve, following his death on 1st Januray 2006, age 54, the Reserve named a nature path, the Riacardus Haber Path. The website contains an account of the creation of the Horsh Ehden Nature Reserve which can be read in the section page, First Nature Reserve. 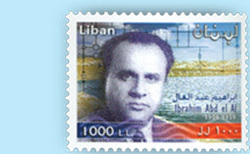 of Ibrahim Abd El Al) was founded in 1991 in his memory and continue in issues of Water Resources. Kahlil Gibran (1883-1931) World-renowned Lebanese poet and writer, Kahlil Gibran, has many beautiful quotes and drawings about Nature and Mankind's relationship to the Earth. A wonderful scholarly article has been written about Gibran's perceptions about nature and the environment entitled: "Kahlil Gibran: Poet of the Ecology of Life" by Dr. Suheil Bushrui.